Be the first to share your favorite memory, photo or story of Enos. This memorial page is dedicated for family, friends and future generations to celebrate the life of their loved one. 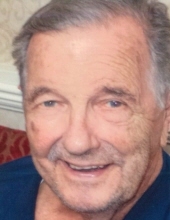 Enos “Jack” Francis Roche, a longtime resident of Clawson, died Saturday April 13, 2019. He was 86 years old. Jack was born July 2, 1932 in Detroit to parents Margaret Cecilia (nee Brown) and Enos Francis Roche, Sr.
Jack married Florence Mills on September 8, 1951 and was a successful self-employed electrician. He was an avid Detroit Tiger fan who enjoyed golfing, traveling, and following many other sports teams. When his children were younger, Jack coached their softball and youth hockey teams. He will be deeply missed. Jack is survived by his seven loving children, Peggy (Ron) Shoquist, Jackie (Terry) Bell, Tim, Steve, Kevin (Barbara), Jeff (Sheryl), and Dale (Sally) Roche. He is also survived by his 12 grandchildren, 5 great grandchildren, and sister, Sally (Jerry) Carter. Jack is preceded in death by his beloved wife of 59 years, Florence Roche. A Funeral Mass will be celebrated at Christ, Our Light Catholic Church, Coolidge Rd. (between 15-16 Mile Rds.) Troy, on Tuesday at 10:30am. Friends may visit beginning at 10am. Burial in Guardian Angel Cemetery, Oakland Twp. "Email Address" would like to share the life celebration of Enos "Jack" Roche. Click on the "link" to go to share a favorite memory or leave a condolence message for the family.